US, 2004, 94 minutes, Colour. Will Ferrell, Paul Rudd, Christina Applegate, David Koechner, Steve Carell, Fred Willard, cameos by Vince Vaughn, Luke Wilson, Ben Stiller, Tim Robbins, Jack Black. Senses of humour are notoriously different. One culture's hilarity is another culture’s stone-faced incomprehension. This could be the fate of Anchorman. However, these first sentences are offered as an excuse and a defence for saying that I found it very funny – all the way through. In fact, I had to wipe my eyes so that I could read the sub-titles for the conversation between the dog and the Kodiak Bears during the climax! 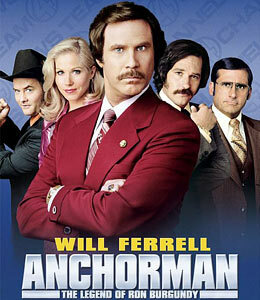 Ron Burgundy was invented by Will Ferrell (who proved that a human elf over six feet tall could be engaging in Elf). He enlisted the talents of writer-director, Adam Mc Kay and developed this parody of a San Diego TV news anchorman of the 1970s, the days when anchormen were celebrities and the women did not have a chance. The film is a succession of funny sketches as we see a really not very bright Ron basking in his reputation, then dismayed when the networks employ a woman and, in a cruel fate as he absent-mindedly throws a burrito out his car window and the enraged cyclist that he hits boots his pet dog into the river in retaliation, misses his time – and she goes on instead and is successful. Christian Applegate enjoys herself as Ron’s rival. There are some very enjoyable turns by the supporting cast, especially from Paul Rudd and Steve Carrell (the TV announcer who fell victim to Jim Carrey in Bruce Almighty) and Fred Willard (the announcer in Best in Show). Audiences will want to be on the lookout for cameos from Vince Vaughan, Luke Wilson, Tim Robbins and Ben Stiller as rival anchormen. Jack Black is the irate dog-kicker. The comedy tends to avoid the bodily function jokes that seem to be requisite for American satires. Rather, it is the situations, the verbal humour, sight gags and general genial spoof of the pretensions and macho assumptions of those days. 1.A funny film? Appeal to American audiences? Worldwide audiences? Audiences seeing America satirising itself? The satire on the 1970s, on television, on the media world? 2.The tradition of this kind of American humour, Saturday Night Live, a collection of sketches, imitations and mimicry, the development of eccentric characters, issues for satire, parody and spoof? 3.The verbal humour, the wit, the deadpan comments, the mockumentary voice-over, the characters and their expressions? 4.The visual humour, the costumes, the hair, the mannerisms, the preening, the angles and shots and the editing and pace? The humour of the conversations between the bears and the dogs with the subtitles? 5.The musical score, the songs of the time, the background music? 6.The voice-over, the commentary, the 21st century perspective? The documentary style of the film and the makers having looked at footage of the time? The stars studying the documentaries and the personal styles of the anchormen? 7.Will Ferrell and his contribution to the film, the writing, performance? His behaviour during the credits and the multi-images on the monitor as he limbered up for his broadcast? Seeing him at work, reading the telecard? His saying that San Diego was classy and everybody repeating it, the range of the audience from the bikies to the babies all responding? In the studio, his relationship with Ed, with Garth? With his team? The stories on the news, his giving San Diego their opinions? Ron Burgundy as a person, a celebrity, the image, his fans, his house, his relationship with his dog? His not knowing how dumb he was? Preening? 8.The team and the visual presentation of the team and their collaboration, the characters, as a group, on the introduction to the news and their specific roles of sport and weather? The introduction to each of them, together, the bonding, pancake breakfast…? Their partying, living up to their image? Champ and his doing the sports, his moves, his infatuation with Ron, the dialogue indicating that he was in love with him? His behaviour towards Veronica and its sexism, her groping him instead? Brian, his fancying himself, preening and presumption? Brick, thick as a brick? His echoing the others, his non-sequitur dialogue? Their attitude towards the women, harassment, their persecution of Veronica? 9.The bringing in of diversity and Ron not understanding the word, the meeting, his behaviour, the reality of Veronica coming in, Ed and his trying to introduce women into the television world? Her not having a room but a desk? The sexual harassment, people’s rudeness towards her, her resistance, groping people back? The tour of the city, bonding with Ron, trying to be professional, the restaurant and being impressed by everybody knowing him, his playing of the flute? Going home with him, the sexual relationship? Her wanting it a secret, his proclaiming it to everybody and on the air? Their being a couple? 10.The accident with the burrito, the dog in the car, Ron’s devotion to his dog, yet hitting the biker, his getting off, accosting Ron, getting the dog and booting it into the river (after missing it and hitting the post)? His being late, Veronica going on, the effect on him, his mental and moral collapse? His having to share time with her, the on-air seeming friendliness, their bickering as the image continued with the credits? The stories that he had to cover, Veronica’s resentment at having to cover fashion stories and animals? The meeting with the women, the deciding to put the swearing on the cue card, Ron not thinking and reading it, the hyper-reaction of his public? Their demonstrating outside the studios, their abusing him, throwing things at him? His collapse, unshaven, wandering the city, at home, in the bar, the barman and the talk? 11.Veronica, in herself, her ambitions, the dream of being an anchor? The relationship with Ron, his proclaiming it? Champ and Brian mocking her? Her going on full-time, their heckling her? Her success? The discussions with the women, her feeling guilty about Ron swearing on air? 12.The covering of the story of the panda for so many days, the birth, everybody turning up, getting the proper spot, her being pushed into the bear pit? Her being absent, Ed and his ringing up, Ron coming and being transformed, shaving etc? His decision to save Veronica or not, his jumping into the pit? The dangers, the reaction of the bears, the dog turning up, its chatting with the bears, explaining things to them (in subtitles)? Their being saved? Everybody applauding? 13.The walk around the town, their coming up against the TV team that had come second, the confrontation, the later fight and the all-in brawl? The cameos of the stars and their representing different studios and networks? Ben Stiller and the Hispanic accent? Luke Wilson and his losing his arms? Their later being present with Veronica in the bear pit? 14.Ed, the boss, deadpan comments, trying to change things – and his phone calls about his wayward son? 15.The mockery of the chauvinism of the 70s? The aftermath, Ron and Veronica, the happy marriage, the family, their still being on the air?